Many professional services companies create marketing materials to provide their clients with relevant information for their business needs. CBIZ Inc. is one of the best in their industry at doing just that and e design has had the privilege of creating the CBIZ MHM Business Tax Planning Guide for the past four years. This Tax Guide serves as a tool to help businesses with growth, investments, estate tax planning and more. As with all the materials that e design creates for CBIZ (which is a lot! ), this Guide follows a vision of branding but is always unique in it’s own right. We created other graphics to tell the story of the Tax Guide which includes an email signature graphic, an email blast announcement and a button for the CBIZ home page. Several years ago, e design created a Corporate Standards Guide for CBIZ which included the usual branding information: a corporate palette of colors, fonts, logo usage rules, etc. Although the Standards Guide is a vital tool, it also gives us the flexibility to think outside the box and deliver the best design and ideas as possible with each piece of collateral that we produce. This is why we’ve been able to give the Business Planning Tax Guide and so many other communication pieces a unique look while staying true to the CBIZ messaging and mission. Branding isn’t about copying corporate rules verbatim; it’s about pulling pieces together as a whole to tell a story. Consistency is key when branding many pieces for a single business, but no business should have standards so strict that every piece of communication looks identical. Sounds a little boring, eh? Not to mention the world we live in expects change, excitement and keeping up with the latest trends. If you’re interested in creating exciting corporate branding materials (no, that’s not an oxymoron in our opinion), don’t hesitate to get in touch. We get our kicks in corporate design! You can tell by looking at our other branding projects we’ve completed over the years. 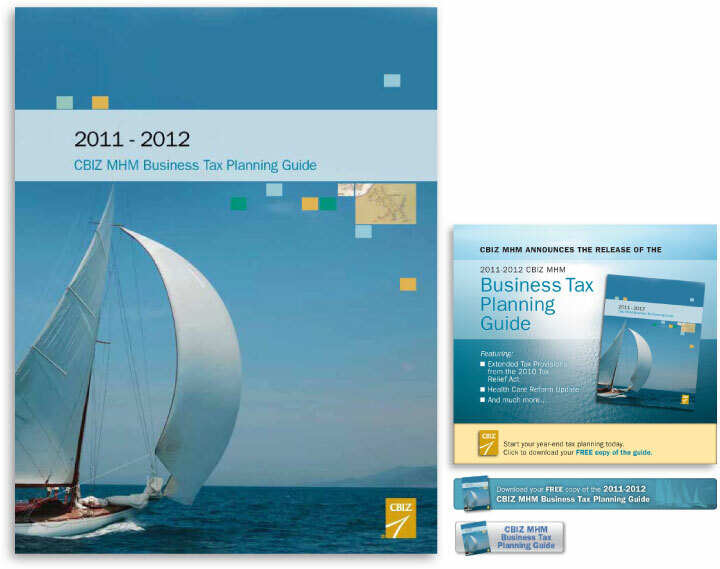 And don’t forget to grab a copy of the CBIZ MHM Business Tax Planning Guide! CBIZ, Inc. is one of the Top Ten accounting providers in the nation with an impressive 5,200 employees and over 140 offices nationwide. CBIZ provides a comprehensive range of business services that includes accounting services, employee services and much, much more.